Behind every pop act is a loyal legion of fans, but whose army stans the hardest? 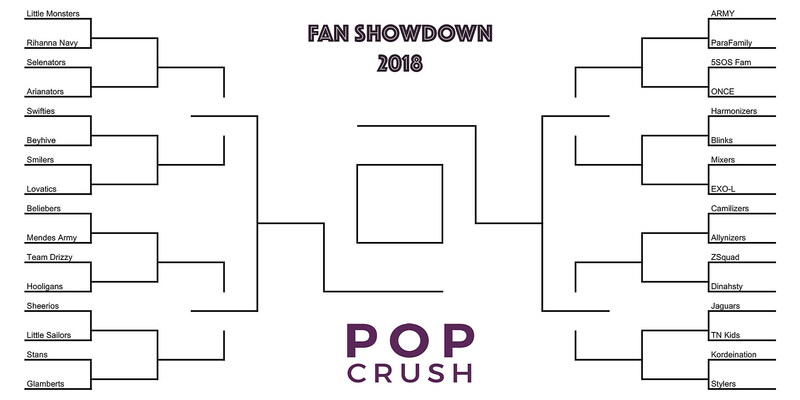 For the third year in a row, PopCrush is putting it to the test with a month-long, bracket-style competition to determine which fandom is the fiercest. We're starting off with four quadrants: female solo acts, male solo acts, groups, and former group members. Each competitor will go head to head within their own category for three rounds. Then, the last one left standing will advance to the Final Four, where they'll face off with the winners of the other quadrants until, finally, one winner is crowned. Round 2 of the competition begins today (April 11) and ends on Monday, April 16 at noon; Round 3 begins April 17 at noon and ends April 22 at noon; the Final Four begins April 23 at noon and ends on April 25 at noon; and the winner of the final showdown will be revealed on May 1. You can view the full bracket here and vote in each quadrant below. The battle begins now!